HERE MIGHT NOT BE much overlap between American football fans and sacred music professionals, but I am one point of intersection. 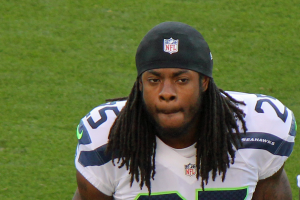 Last Sunday were the Conference Championship games in the NFL, and the biggest story coming out of the NFC Championship was a rant by Seattle Seahawks cornerback Richard Sherman after the game. He let it rip into the camera and yelled at a reporter, taking shots at the opposing teams’ players. Many people, myself included, thought this was bad behavior and even worse sportsmanship, though some of the backlash has been overblown. One reason it was overblown is that Sherman was approached by the reporter right after the game, which ended on a play in which Sherman himself was the hero. When the reporter interviewed him, he was still completely pumped on adrenaline and machismo which is necessary in these kinds of situations. That he couldn’t just drop that persona is excusable, in my opinion. That he didn’t later regret it is the problem. I still understand where Sherman is coming from, though. To some degree, we need to pump ourselves up for performance, and like it or not, playing and singing at Mass is a performance. Many people don’t like to think of “performing” at Mass, and I understand that hesitation, but performance is the means by which music is accomplished. You do not mumble, stutter, ruthlessly execute, or even proclaim music. As a performance art, it must be performed. To do this well, you have to be confident. People who know me well might think that this is strange coming from me. Ask my wife, and she will tell you that I am Captain Insecurity when it comes to organ playing, singing, conducting, literature selection, and even dressing for Mass. I constantly feel underqualified for my position, that I snuck in and no one has realized it yet. When it is time to play, sing, or conduct, however, I have to put on the mask of confidence in myself. I have to pump myself up, just like Richard Sherman does, and believe that I am the Best in the Room. This isn’t arrogance; it’s simply psychological. The choir can’t follow a conductor who meekly gives cues, an organist will not shape phrases if he is worried about his ability, and the singer, most of all, will not be able to sing to the best of his ability if he is not confident in what he is about to do. The best way to build this confidence, of course, is to become truly excellent at what you do, to practice your craft until you truly are the Best in the Room. There comes a point, though, when bravado takes over, and you have to believe it even if you are like me and constantly worried. The trick, though, is to put down this facade as soon as you are finished with the piece. When someone approaches me after Mass and compliments the choir’s offertory piece, I don’t continue to beat my chest and act like the diva. It is the time for humility, for “Thank you; this choir is a joy to work with” (which, if you have my choir, is easy to say). That is the time to give thanks to God for what he has given to you, and for the opportunity to serve him in song. Allowing any meekness, faux- or otherwise, to creep into your performance doesn’t serve anyone. Giving your best in your performance of your job is the only way to do this job. There is no halfway. When the downbeat comes, believe you are capable, relax into your competence, and take command. It’s the only way to perform.